It looks like a decorative-plaster ceiling, yet it is not susceptible to cracking. “Durable, handsome and fireproof,” it was touted as being cheaper and quicker to install than decorative plaster. It could even be used to cover deteriorated plaster. For owners of commercial, manufacturing, and institutional buildings, these attributes made pressed- or stamped-metal ceilings quite appealing in the late 19th and early 20th centuries. Commonly known today as “tin ceilings,” decorative metal ceilings were widely used during this era in such diverse structures as Main Street shops, offices, restaurants, and manufacturing buildings, as well as in churches, homes, stables, and even passenger ships. 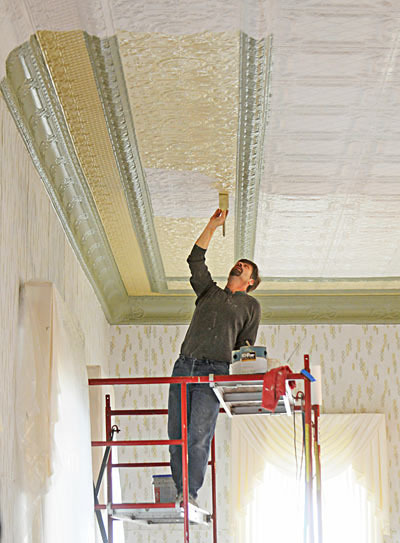 The term “tin ceilings” is actually a misnomer, perhaps stemming from the tradition that anyone who worked with sheet metal was called a tinsmith. The sheet steel commonly used for ceilings and walls was neither tin-plated nor galvanized. While the derivation of “tin ceilings” is subject to debate, manufacturers and suppliers of the period did not use the term. A product of the late Industrial Revolution, decorative metal ceilings and walls were mass-marketed through trade catalogs, home-improvement journals, and builders’ magazines, and even by Sears, Roebuck and Company. The product became available in many patterns, both plain and elaborate, and emulated the popular architectural styles of the period. It was used to repair and upgrade existing spaces as well as in new construction. A common substitute for decorative plaster and decorative woodwork, pressed metal was most widely installed as ceilings and cornices, and to a lesser extent as wainscots and wall finishes. To anyone window shopping along Main Street in the 1920s, its popularity was readily evident. Stop inside these same buildings today and one often finds that this decorative, practical material still is in place. Though mass-produced and inexpensive, it turned out to be very durable. Today there is a resurgence of interest in this product, both as a historic finish material and for new applications. This Brief provides a short history of decorative metal for ceiling and wall applications; outlines information on appropriate maintenance and repair work; describes methods for paint removal; and includes guidance on replacement. While focusing on “pressed” or “stamped” steel, which was and still is the most common form of decorative metal ceilings, much of the same information applies to the lesser-used zinc and copper. The early use of decorative iron ceilings is discussed, but, because they are far less frequently found today, special treatments are not covered in detail.